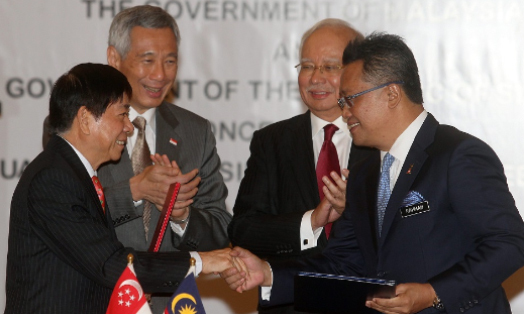 PUTRAJAYA (July 19): Malaysia and Singapore have signed a Memorandum of Understanding (MOU) to work towards commencing the Kuala Lumpur-Singapore High Speed Rail (HSR) operations by 2026. Minister in the Prime Minister's Department Datuk Abdul Rahman Dahlan and Singapore’s Coordinating Minister for Infrastructure and Minister for Transport Khaw Boon Wan signed the MOU on behalf of their respective governments, witnessed by Malaysia’s Prime Minister Datuk Sri Mohd Najib Tun Abdul Razak and Singapore Prime Minister Lee Hsien Loong. This signifies Malaysia and Singapore’s firmest commitment yet to the iconic project. “Malaysia and Singapore has excellent ties and despite global economies uncertainties, our ties still remain strong. Singapore was Malaysia’s second largest source of foreign investment and the MOU signifies Malaysia’s and Singapore’s timeless commitment to this project. “The MOU will be superseded by a bilateral agreement expected to be signed at the end of the year. There will be a team set up which comprises MyHSR Corporation and LTA (as InfraCos) in Malaysia and Singapore respectively. Once the agreement is signed, the team will work on the preparation of tender which is expected to be issued next year,” said Najib in his speech. According to a press release, both governments will take responsibility for developing, constructing and maintaining the civil infrastructure and stations located in their respective countries. 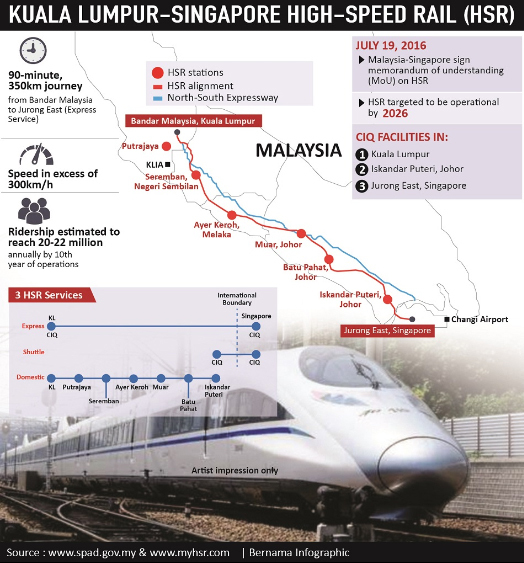 Both governments have also agreed that the HSR will have eight stations, with terminals in Bandar Malaysia (Kuala Lumpur) and Singapore, and six intermediate stations in Putrajaya, Seremban, Ayer Keroh, Muar, Batu Pahat and Iskandar Puteri. All stations will be designed to integrate with the local public transport systems to ensure seamless connectivity. The trains will run at a top speed of more than 300kph. To facilitate swift and seamless travel, both governments also agreed to co-locate the Customs, Immigration and Quarantine (CIQ) facilities at three locations, namely Singapore, Iskandar Puteri and Kuala Lumpur, so that international-bound passengers will only need to undergo CIQ clearance by both Malaysia and Singapore authorities at the point of departure. “This is the reflection of the future of Malaysia and Singapore – an era of growing prosperity. A new lifestyle will be enjoyed by both Malaysians and Singaporeans. Imagine 90 minutes’ travel time from both cities. You can have breakfast in KL, lunch in Singapore and dinner in KL. It goes to show the things we can achieve in the spirit of good neighbourliness and partnership,” said Najib. Lee noted that the goal of having the HSR operational by 2026 was “ambitious”. “Even for the MRT lines in Singapore, it took us 12 to 15 years for the whole project from inception till its service time. This is a cross order high speed rail project on a much bigger scale. “We have to get this right because the HSR will bring the two countries together. It will draw people and our economies together. So, we have a lot at stake and this is a major investment in terms of costing. It is about how much we want to do this together,” he said. A bilateral committee comprising representatives from both governments will manage and regulate aspects of the project which may impact cross-border services. In addition, a joint project team comprising representatives from MyHSR Corp and Singapore’s Land Transport Authority will be formed to coordinate the planning and development works prior to the commencement of operations. The joint project team will be calling for an international tender next month to appoint a joint development partner to provide technical support on the project for both countries.